The Nissan Sylphy that currently selling in Malaysia was launched back in 2008. This car is based on Nissan ‘B’ platform. Since its debut, the Sylphy received many awards and recognition by the local automotive journalists. It is also known as Nissan Bluebird in Taiwan. The Nissan Sylphy uses the all-aluminium MR20DE engine mated with Xtronic Continuously Variable Transmission (X-CVT). The engine outputs 133ps (98kW) @ 5,200rpm with a max torque of 191Nm @ 4,400rpm. The entire combination is designed to deliver smooth and powerful acceleration plus greater fuel efficiency. By using CVT, fuel efficiency is easily achievable. I have never test drive any Sylphy before until I got the key of this Nissan Sylphy Tuned by Impul. This exclusive model is launched in Malaysia in conjunction with the 2012 Autobacs Super GT Series at Sepang International Circuit on 10th June 2012. It is a tuned up model based on the stock Nissan Sylphy 2.0. Just like other Nissan, the Sylphy is easy to drive and spacious inside. I felt the legroom of the rear is as spacious as the ‘D’ segment cars like Nissan Teana or Toyota Camry. The interior is black in colour including the leather seats. However, the leather seats is also available in Brown colour as an option. Thanks to the Electric Power Steering (EPS), that results a lighter steering wheel control. The Sylphy has the biggest boot – 504 litres in its class. The 2.0 XV that we got is a premium model, it comes with Intelligent Key for true keyless start-up and entry. The engine can be started by turning the ignition switch once the Intelligent Key is detected inside the car. I am unsure why that the speedometer of Sylphy is only having a maximum indication of 180km/h, the car may be speed limited to 180km/h based on Japanese local road regulation. I couldn’t put the speed test as one of my test cases due to 110km/h maximum speed limitation on the local freeway here. Therefore, I have request our producer to get us a test track for this purpose. So, let’s keep our fingers crossed and hope for it. Personally, I reckon the location of the power window switches is not ergonomic to be access. Secondly, the touch screen on the built-in satellite navigation system is not sensitive enough to interface with. 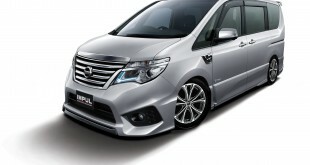 Similar to other Nissan’s Impul tuned up models like Grand Livina and X-Gear, the Nissan Sylphy Tuned By Impul received Impul Blast 2 Exhaust Muffler, a set of 17-inch Impul Aura SX-10 Alloy Wheels, Impul Sports Suspension System and Complete Aerokit. The upgraded exhaust muffler comes with a polished finishing and Impul logo attached on the tailpipe. The exhaust note is sporty. These Impul 17-inch wheels on the Sylphy are finished in black with a shiny polished surface. Accordingly, the wheels are 30% lighter with Impul’s new Super Cast process comparing to the conventional process. According to ETCM about the Sport Suspension System upgrade, the Impul’s engineers carried out extensive testing and development to come up with this setting to deliver comfort, safety and handling. I think this upgrade is the most practical among all other goodies. The entire handling is better, the ride is firmer and provides better driving confidence. The set of aerokit of the Sylphy Tuned by Impul consists of a special designed front grille, front lip, rear apron, side skirts and boot spoiler. You can see the entire front fascia looks different than before, especially with the Impul badge. The Nissan Sylphy Tuned by Impul is selling from RM 125,988 for the 2.0XL and the model we tested – 2.0XV is selling at RM 135,988 on-the-road with insurance in Peninsular Malaysia. The Impul models also come with a 3-year or 100,000km warranty. For existing Nissan Sylphy owners who intend to upgrade these Tuned By Impul accessories to their Sylphy. It is also available to purchase separately at selected Nissan showrooms in Malaysia. Meantime, check out our photo gallery of the Nissan Sylphy Tuned by Impul right below here!